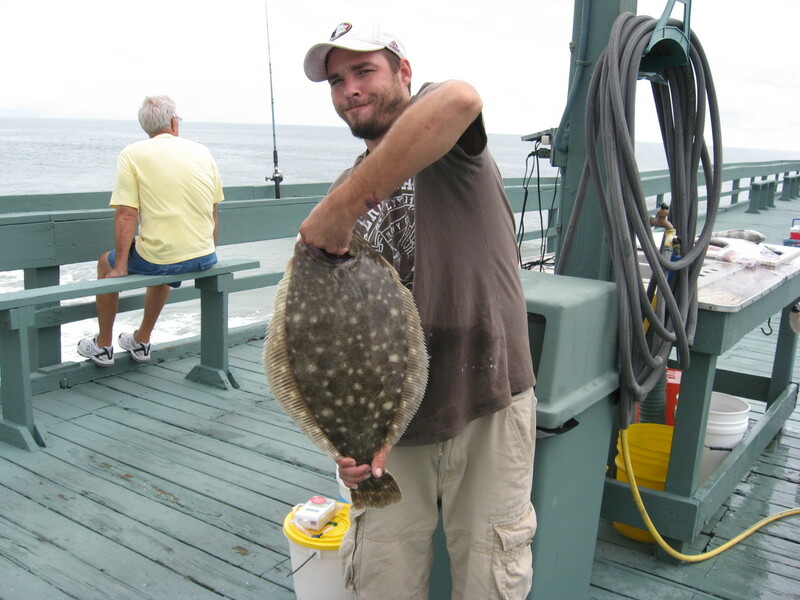 I enjoy saltwater fishing, and I love flounder fishing! In fact, I think it's my favorite kind of fishing of all. Flounder is one of the tastiest fish in the ocean. The flesh is white and flaky, and it has a mild taste. It's also low in fat and high in protein. Flounder can be successfully used in a wide range of fish recipes. Try grilled flounder, flounder stuffed with crabmeat, Cajun flounder, or batter-fried flounder, just to name a few. You can buy the fish at the market, but why not catch your own? It's fun, and with a little practice, it's easy, too! 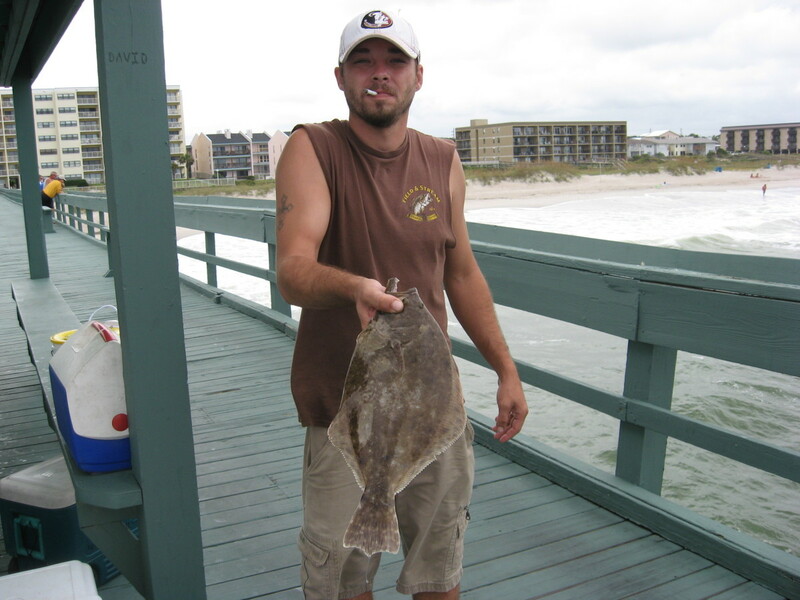 It won't take you long to get hooked on flounder fishing! Flounder, also called "fluke," is a flatfish with both eyes on one side of its head. They begin life as normal fish, but then one eye gradually migrates to the other side. They're definitely not the most attractive fish in the sea - until you fillet them and serve them for a meal! 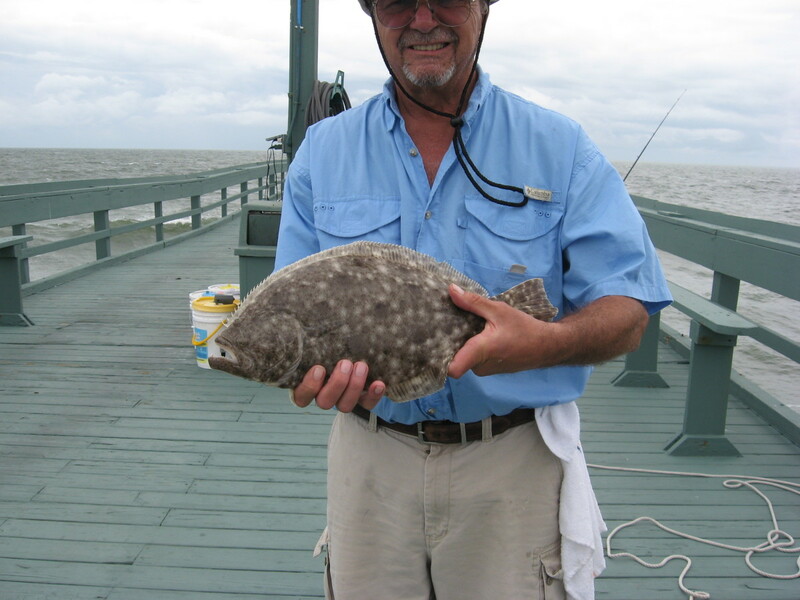 To catch fluke or flounder, you'll need a medium-action rod and a reel loaded with 15-20 pound test line. Many anglers will tell you to use lighter tackle, but after I lost a few big doormat flounder, I go prepared now. Some of these flatfish have a knack for wrapping your line around a pier piling. Attach a two-foot length of wire leader to keep the fish's sharp teeth from biting through the line. You'll also need a sliding egg sinker. The weight of the sinker depends on how strong the current is where you'll be fishing. You want to be able to keep the bait on or near the bottom. Tip the leader with a round flounder hook. These circle hooks hook the fish in the jaw and help avoid losing fish. Also, they generally keep the fish from swallowing the hook, so if you catch a flounder that's too small to keep, you can release it unharmed. 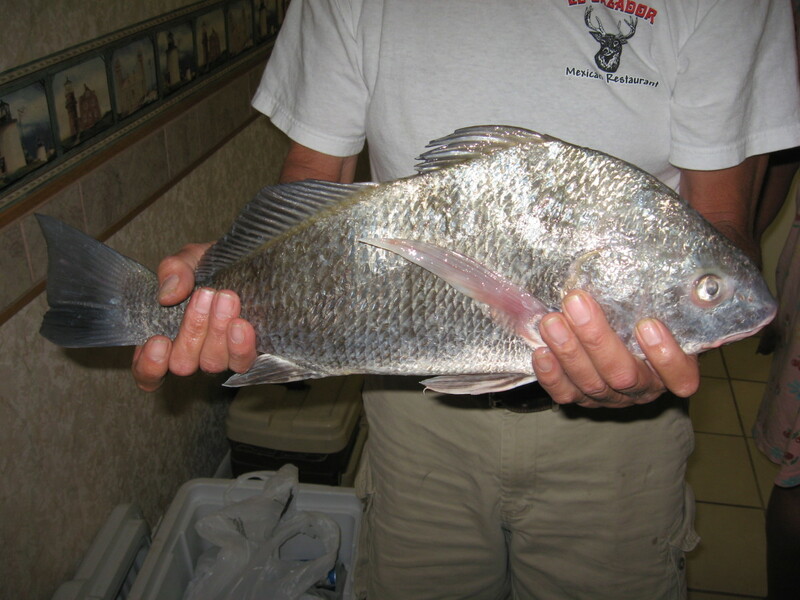 For flounder fishing bait, use live shrimp, live mud minnows, finger mullet, or just about any small live fish. 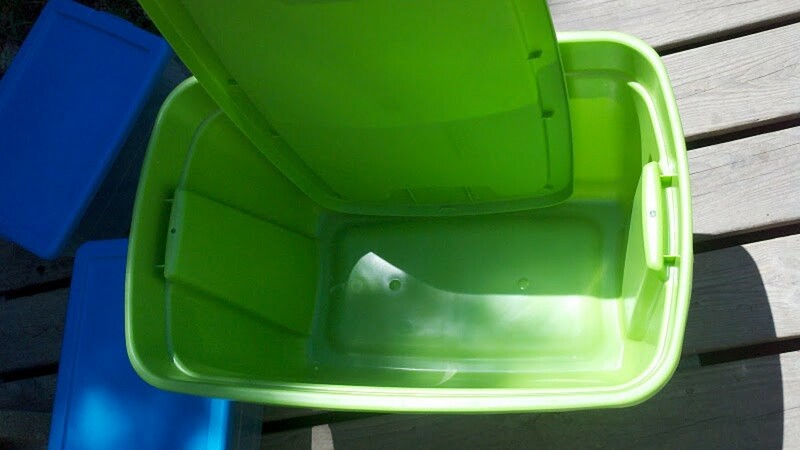 Keep live bait fresh and lively by using an insulated bait bucket with an aerator. Use a small aquarium net to retrieve a shrimp or minnow from the bucket. Hook shrimp through the horn. Minnows should be hooked through the lips. Artificial baits are often good choices, too. One of the best is a leadhead jig. Try a red head with a white grub body. If you don't get any strikes, try a different color grub. For proper flounder fishing technique, you need to understand how a flounder eats. They don't actively pursue bait like some predators. Instead, they lie on the bottom and cover themselves with sand in order to camouflage themselves. Then they wait to ambush any passing prey. Once they catch it, they might hold it in their mouths and swim to another location to dine. Flounder, or fluke, like structure. 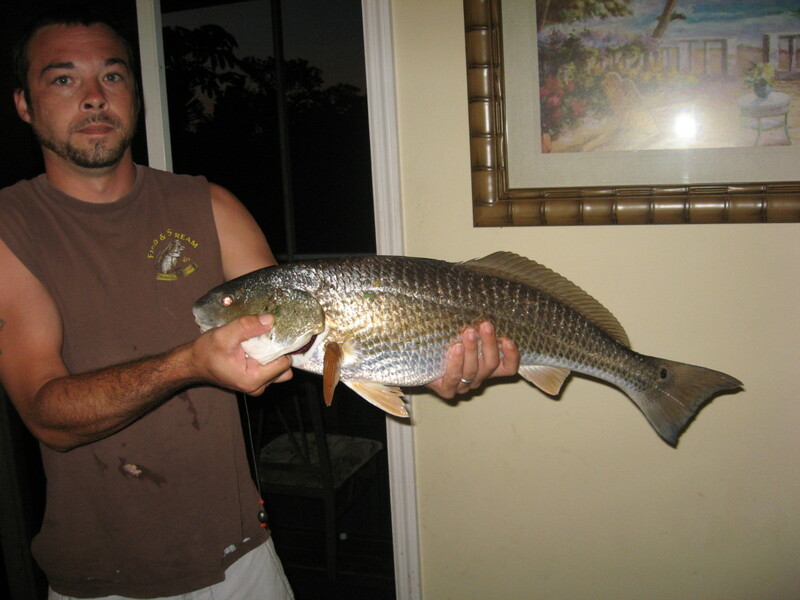 Toss your bait around pier pilings, jetties, bridge supports, or rocks. Retrieve your bait slowly, dragging it along the bottom. When you feel a strike, don't try to set the hook immediately. Wait to be sure the fish has the bait. The circle hook usually sets itself. Allow the flounder to remain under water until you can net it so that it won't panic and put up a frenzied fight to escape. Or...there's the easy way - the lazy man's (or woman's) way. It's my preferred method for flounder fishing, actually. 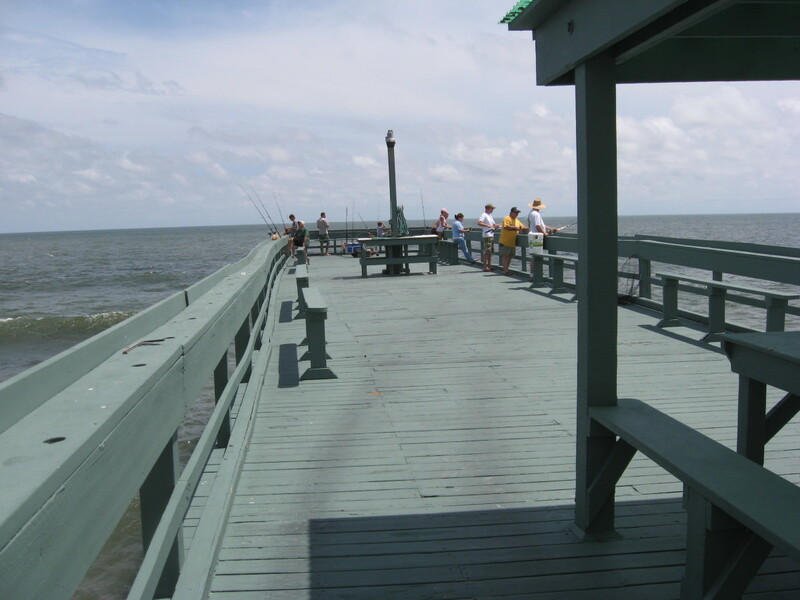 Just place a live shrimp or live minnow on your hook and cast it under the pier. Reel in any slack in your line, and place your rod in a rod holder. If the pier rail doesn't have a rod holder, tie your rod to the pier with some stout cord. Now comes the important part: Sit down and get comfortable. Have a nice cold drink. Chat with a pal or make a new friend. Every once in a while, lightly test your line with a finger without disturbing your rod. Many times, you'll feel a flounder on the other end of your line. Reel it in slowly and lift the flatfish from the water with a drop net. Clean it, batter it, and fry it. Or if you prefer, blacken it, broil it, or stuff it with crabmeat and bake it. It's almost impossible to mess up the wonderful taste. 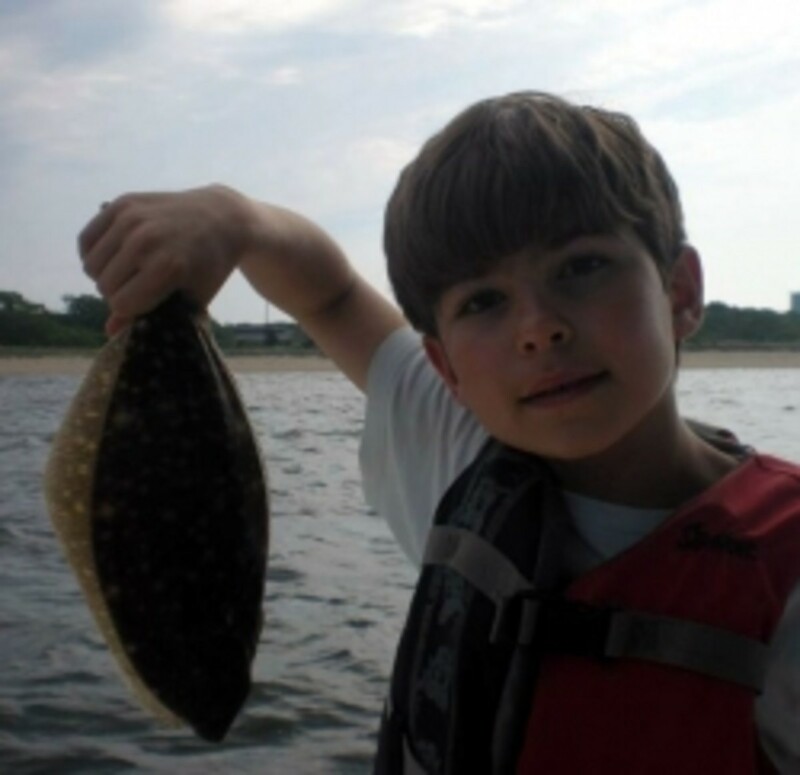 There are thousands of devoted flounder fishing anglers, and each one has his or her own favorite baits and techniques. Many would offer you different flounder fishing tips, but I'm just sharing with you what has worked for me. You might find something you like better in a flounder fishing video below. I suggest using several different methods and baits until you find one that's successful for flounder or fluke fishing in your area. I've caught more flounder using the lazy method than by any other means. It's fun, effective, and super easy. It's so relaxing to watch the moving of the ocean and to feel the sea breezes on my skin and in my hair. Very little work is involved, so it's easy to be patient. Of course, I've spent a lot more time using that particular strategy. Hmmm...could be the reason I've had so much luck with that specific type of flounder fishing. Fishing tips for beginners, for bluegill fishing. 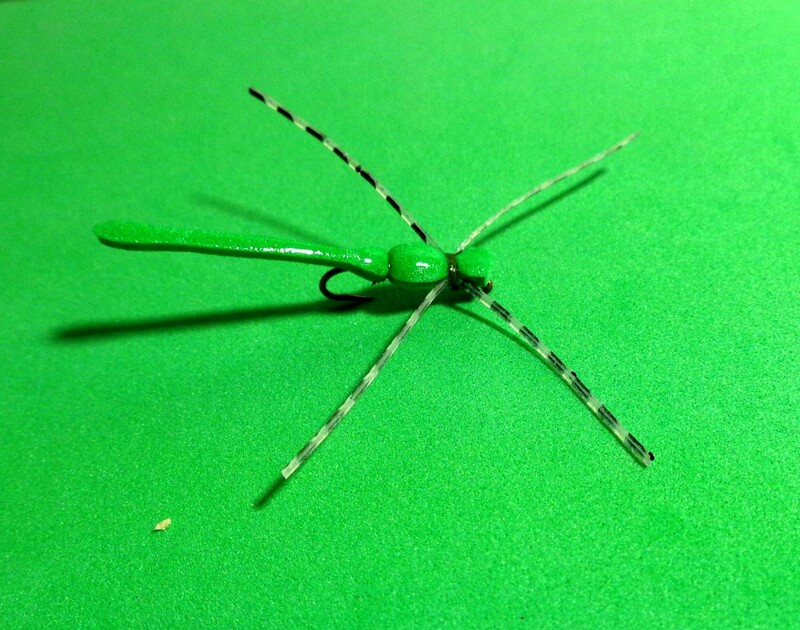 Photos, fishing jigs, fishing techniques, and videos included. This one weighed almost seven pounds. Wow! What a blog! I actually love how it is easy on my eyes and also the data are well wrttien. I am wondering how I might be notified whenever a new post has been made. I have subscribed to your rss feed which must do the trick! Have a nice day! Thanks, Granny! How do you cook your flounder? Hi, cjmo! I've caught flounder that were even larger! Really great Hub! I didn't realize these fish actually got so big. Love the pictures also. Bob, did you read the article?? I suggest line size, baits, and jig color. I also suggest good fishing locations. Our methods for catching flounder are obviously different. Most of mine have been caught from a pier, so I can't allow them to take line. If I did, I'd be wrapped around a piling. And as far as water depth goes, I've caught flounder in deep water and in water so shallow the fish were almost beached. Where are you fishing? 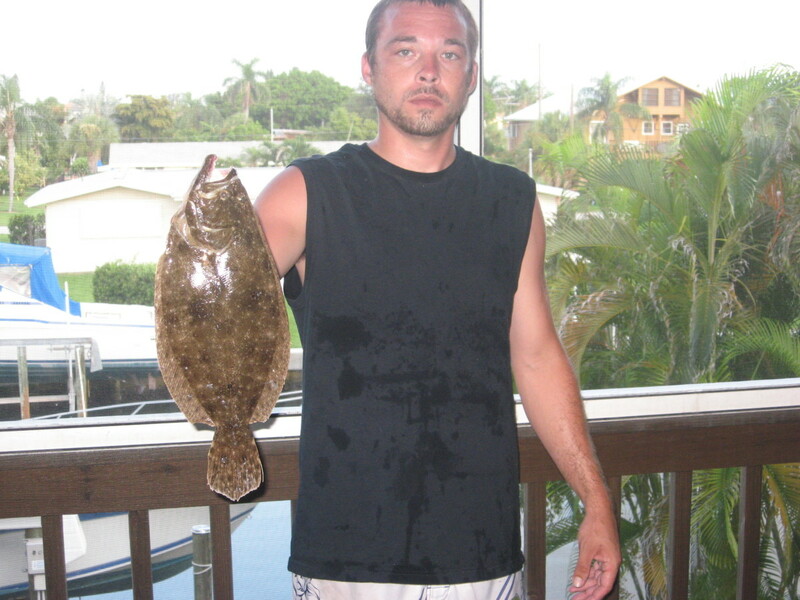 My flounder fishing is done in FL and GA. There are countless videos like this out there. Nice to watch but with no information at all. How far from the shore. By watching thousands of Fisherpersons one might find one who really knows what he/she is doing. Sure it´s nice to have a fancy boat and life bait and all that schnick schnack. One spends then a lot of time keeping up with all that crap. Shure there are places were nothing goes without a boat. I in my case fish on sandy beaches close to rocks for flounders and for corvinas wherever they tail. I prefer Storm shallow running Thundersticks black 4 1/2 inches gold, metallic/transparent, orange (from top to bottom). I caught countless Corvinas and Lenquados(flounders) on them. Rapala X #10 in the same color are also good but cost more that double that much. I fish from shore with two feet of bite leader 20lbs (loop knotted to the lure) then a swivel then a shock leader 15 feet of 15 lbs and running line of 10 lbs for distance casting. The 10 lbs running line fills the spool but has a blood knot just 2 yards longer than the farther distances I cast so I change, when necessary, ony that 50 or 60 cranks on my ambassadeur and leave the unstressed part of the 10 lbs line on the spool. The blood knot is the best money saver for economic fisherman. I do not add any weight to the shallow running thunderstick. Lead acts like a fulcrum around which the thunderstick swivels. That makes it tricky to cast and does not add in distance. The danger is also that that lead makes the lure swivel around and catches the waders which are essential to this type of fishing. Lubricating my ambassadeur is another science. Shure original lubricatin is the best but hard to find in remote places. I grease the bearings with motoroil after I take the reel apart. (Not from the outside wich leads to drag failure). Then with axle grease the spool disengaging mechanism. I oil the worm gear while I am fising every 30 minutes with a drop of high grade saw machine oil. Important is to engage and disengage and crank the ambassaduer a couple of times every day if it was used in saltwater before. Smaller corvinas have also the habit of zig zaggin and running full speed into a slack line. That habit makes it necessary to give the drag a low start up setting as not to loose the corvina to the created shock. I let my fish take as much line as the want. Sometimes 150 Yards and more. The drag increases anyway the less line is on the spool. So I do not need to readjust the drag setting. The ambassadeur give me anyway the option to thumb brake the fish which I do not do anymore it just incrases the speed of the running fish. I also set the casting brake at a level that the lure decends slowly whe disengaged. Thumbbraking takes years of practice but I fond it the better way to maximize casting distance. One just have to bare touch the spool with the utmost tip of the thumb at the beginning of the cast and then release it for the rest of the cast. There are lots of high priced reels on the market but nobody really helps you to keep that thing running in saltwater. So I am pretty happy with my C3 Ambassadeur. Not fancy but who wants to spend 3 to 400 Dollar on Reels that call themselves saltwater fit and can´t live up to that harsch environment. Thanks, Dolores! The legal length in Florida is 12 inches. I think it's the same in Georgia. I enjoyed your lesson on fishing for flounder. Up here in Maryland, the flounder has to be the size of a door mat in order for you to keep it. My son once caught one of these. I peered over the rail and could not help but yell. It was huge. It fell off the hook. My son, to this day, claims that I scared it away.